Why seed a tomato? Tomato seeds and their surrounding gel contain a lot of liquid. In certain recipes, that extra liquid can mess with the texture– like in Israeli Salad, for example. Some people have trouble digesting the seeds, which is another good reason to seed your tomatoes. During the seeding process, you can also get rid of the tough, white, flavorless parts attached to the core. Most of a tomato’s flavor resides in the red fleshy part, not the seeds and their gel, so tossing the seeds won’t change the flavor of your dish much. However, the gel does contain vitamin C and some nutrients, so be sure to check your recipe… sometimes having the seeds and extra moisture in the mix can be a plus! 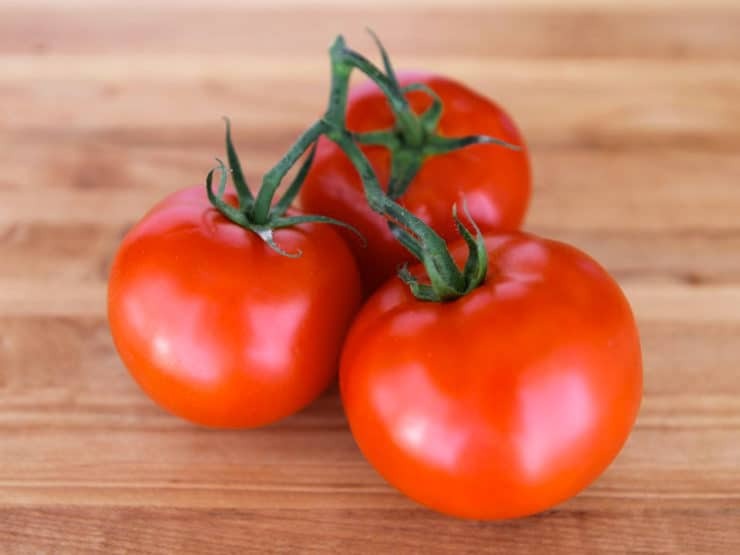 If you are ready to seed your tomatoes, read on for three simple step-by-step methods. In some dishes, both seeding and peeling the tomatoes is recommended. 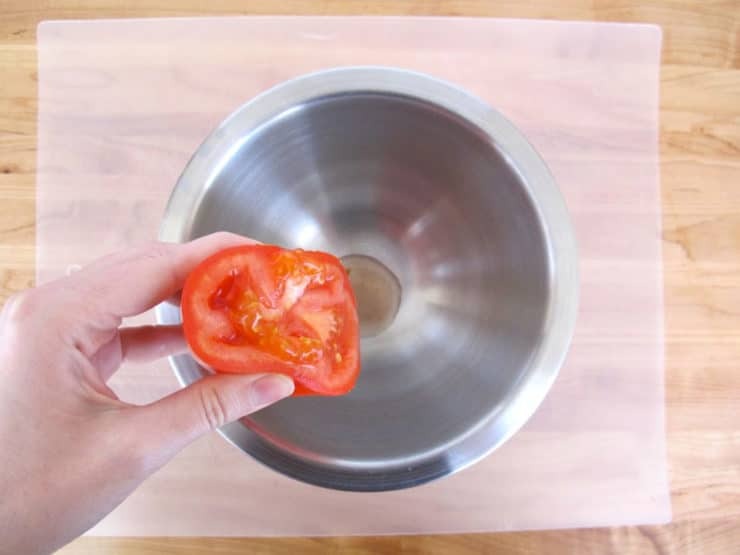 To learn how to peel a tomato, click here. I’ve posted three different ways to seed a tomato below. 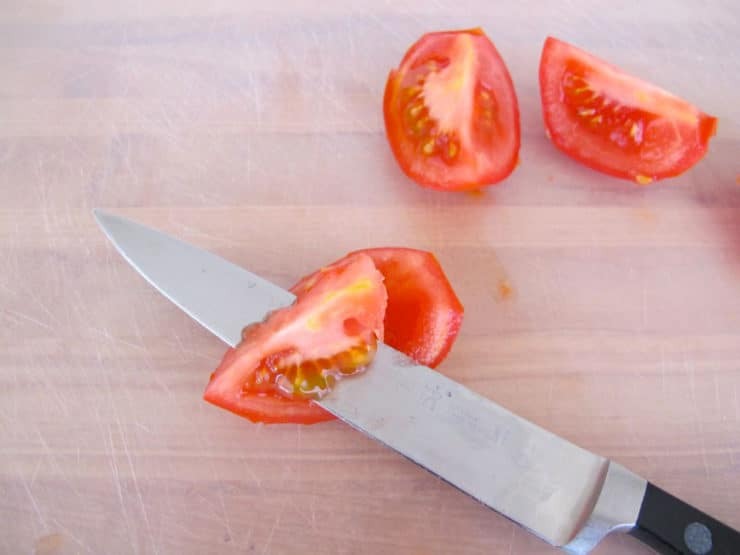 Method 1 is my preferred method; it keeps the tomato largely intact while sacrificing a minimum of the tomato flesh, meaning you’ll have more intact flesh to work with for dicing, slicing, or whatever you need. I also recommend Method 1 if you plan to stuff the tomato; it helps to keep the walls of the tomato firm. 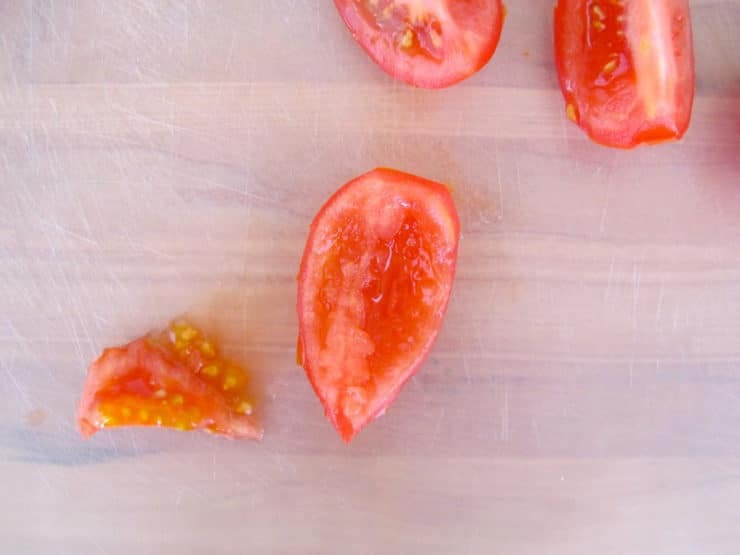 Method 2 is fastest, and best used when seeding lots of tomatoes for something like a sauce– it can leave the skin a bit mushed and bruised, so I wouldn’t use this method for a salad. 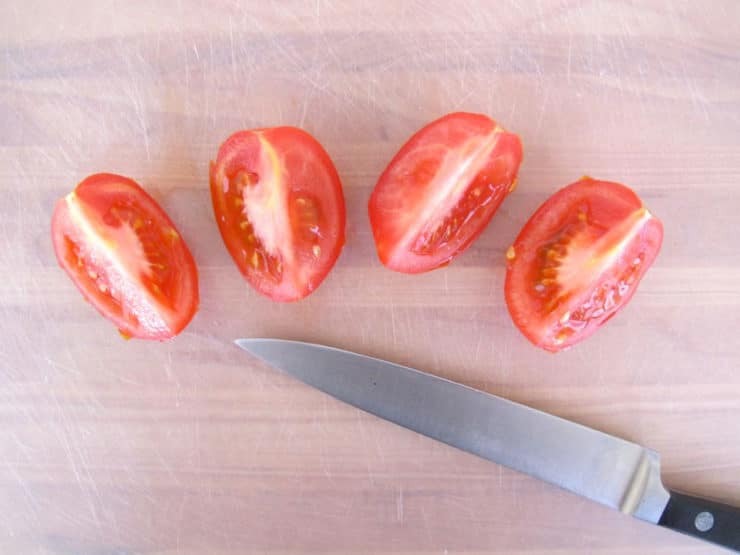 Method 3 is great for when you want to quickly seed 1 or 2 tomatoes for a salad, but slice carefully– you can cut away useable tomato flesh if you’re not careful. All three methods work, so choose whichever is best for your purposes. Three easy ways to seed a tomato quickly and easily with step-by-step pictures. Roll the tomato sideways so the stem faces to the right, and cut the tomato down the center "equator" line into two halves. Use a small spoon (I use a quarter teaspoon) to scoop the tomato seeds and any tough white core out of the four seed cavities. Discard the seeds. 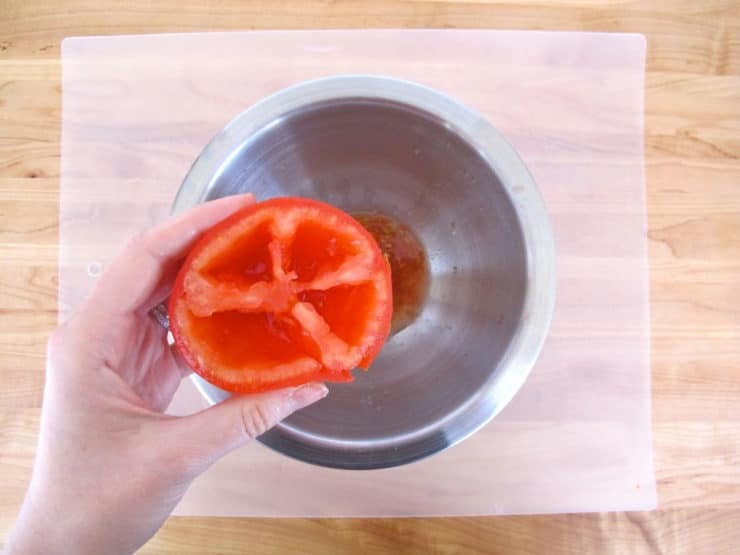 Gently squeeze the tomato halves over a bowl to dislodge the seeds from the seed cavities. Try not to squeeze too hard; use gentle pressure to keep the flesh intact and prevent bruising or a mushy texture. 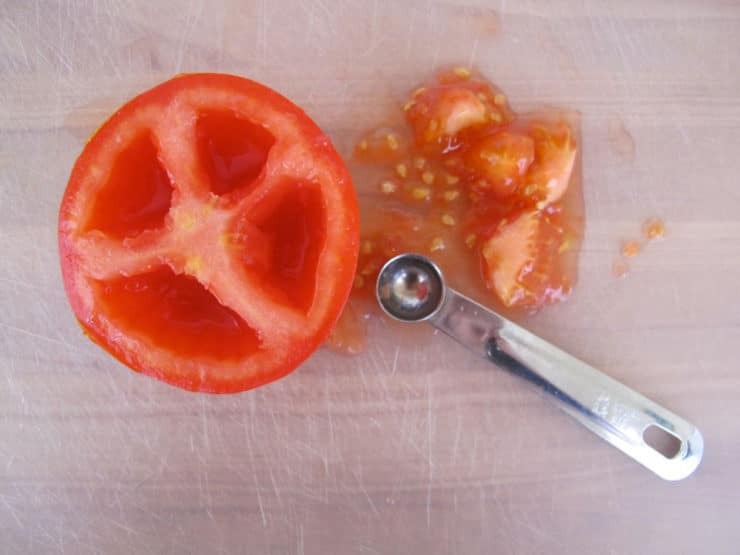 Use a spoon or your fingers to scoop out any seeds or tough white core that clings to the tomato. Discard the seeds. 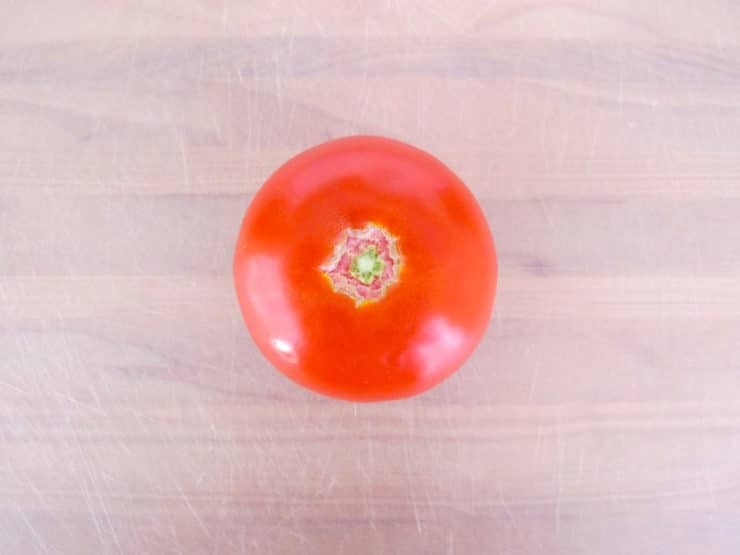 Slice the tomato vertically (from stem top to bottom) into four quarters. 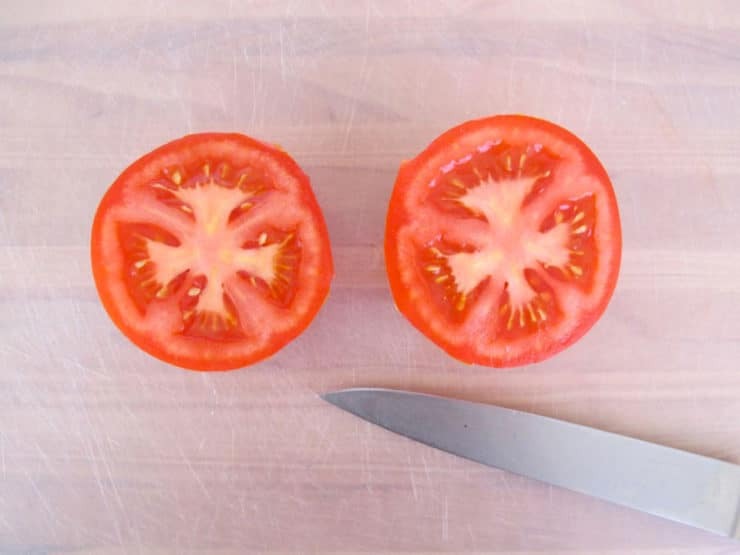 Use a sharp knife to carefully slice the seeds away from the tomato flesh. Note: Nutrition info above is for 1 pound of tomatoes. I subscribed for the first time because it was super helpful and visual. Please include pictures and all small details into the recipes for people like me who needs it!!! Thank you!!! Very helpful. Been trying to figure out how to remove these tomato seeds.
. It sounds a little gross but it’s not and works well for me I cannot eat seeds but love tomatos. My daughter insists on seeding for her own personal preference. I saved what we removed and want to use it to make a jelly. Do you have a recipe? No, sorry Wanda, I don’t. So if we are going to have to remove the peel and the seeds for sauce, what is the best to do first boil to remove peel or discard seeds? Love your methods and will be using these to make my sauce next week! THANK YOU!!! cook it down over medium heat for about an hour and a half…..it thickens beautifully! I would say, cut them in half and scoop out the seeds as shown, place them face down on a tray and freeze them (foil-lined for easy clean-up). After they have frozen, lift off the peels and toss the tomatoes into the pot for cooking. I recently listened to Dr. Gundry that tomatoes contain large amount of lectin which causes leaky guts and then further cause inflamations and autoimmune diseases. He said, however, that removing skin and seeds will get rid of most of lectin. Dr. Gundry says that pressure cooking tomatoes destroys lectins; however, I just put my pressure canned tomatoes in a blender and then pour them through a mesh strainer to get the full benefit of pulp and juice. There is a more important reason for seeding your tomatoes. You touched on it but did not reveal the real importance of seeding. Flavor, which you mentioned, is a major concern in most dishes fresh or cooked. Unless you desire a slightly bitter taste to your fresh tomato dishes seeding is imperative. I find this true especially when making a good salsa. 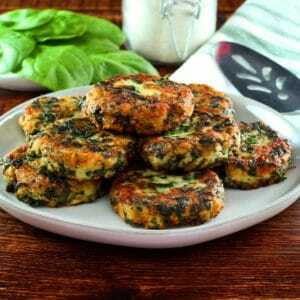 To provide proof of this get some cilantro, white onions and fresh ripe (flavorful) tomatoes. Make the salsa both ways with and without seeds and pulp. Take a bite of each seedless version for the first mouth full and remember the taste as you chew. Second take a bite of the version with seeds and compare the taste to the seeded version. After having tasted both salsas made from the same ingredients you will know how bitter tomato seeds will make your food. For our family and friends we try to never use a fresh tomato with seeds unless we specifically are looking for the bitterness to complement a dish. I thought that was the case , thank you for this info. Good to know. This is the first time I noticed that, and I have worked with tomato yields for quite some time. Wish I had known this sooner! Thank you so much for this site! This is the first time I tried seeding my tomatoes, and I botched it badly and it took a long time. Finally decided to google a better way. So glad I found this! I would use a fine mesh strainer for this. Put the seeds and their juice/gel in the strainer over a bowl, then push and scrape the seeds into the mesh strainer with a spoon to extract the juice. Thanks so much now I don’t have to give up my fresh tomatoes. I have been told no veggies with seeds, tomatoes was listed. I eat them every night (I use to gow them in Michigan & Iowa) and that made me sick. Now I will try Method 1–I sure don’t want my Diverticulitius stirred up. This message is to Jackie. In case you haven’t checked with your doctor lately, I suggest that you do. From more recent studies, doctors are no longer saying to avoid seeds for those of us with diverticula. I have tomatoes and other seeds now and am still able to use care to avoid diverticulitis. Thanks, Tori. I’ve never wanted to seed tomatoes, because it felt so wasteful. But your method will help me minimize the waste. Now I won’t have to scoop excess liquid off the top of my salsa. Thanks from Santa Fe, NM. Thanks so much for this information. I can’t digest the seeds and have always wondered the easiest way to take them out. Number 1 was is the best for me, thanks so much. Thanks for the information. I was always doing method #3. Method #1 seems easier and will do that next time. Should have read this first. Oh Tori, thanks a lot, I have been advised to avoid tomato seeds. I was searching for some easy ways to remove them, I saw your steps.They are helpful. Very helpful, than you very much! Thanks for this simple, direct guidance. Sure appreciate it! Bet this will improve my salsa! Just wanted to say thanks for the info. As a beginner, I can use all the help I can get. Have any suggestions on making a simple Alfredo sauce the doesn’t separate? 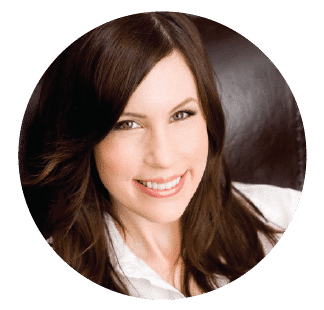 Thanks Tori, I love your writing style…very easy to follow, thorough, and gracious! I wont tell you the crazy way I was doing this! Thanks so much. This will make my pico de gallo so much faster to make. When you want to both peel and de-seed tomatoes, which one should you do first? Thanks, your site is great! Peel first, then deseed. 🙂 Glad you’re enjoying the site! Your tips on peeling and seeding tomatoes have just saved me hours of time and lots of wasted tomatoes. Thank you! I’m sorry Mae, but this is a cooking site, not a gardening site. You should Google “tomato seeds for my garden,” I’m sure you’ll find what you’re looking for. Good luck! Spread the seeds on a paper towel n let dry. 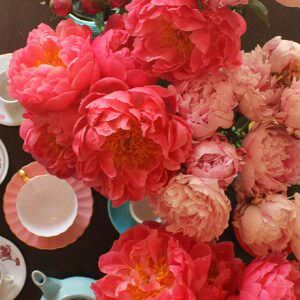 Use the dried seeds for planting. Thanks for the info. I can always equate “discard” with “add it to my compost pile”. No.1 seems the easiest to me. You are right, some salads (especially when grains involved) do not handle the extra juicy very well. Why do you discard the seeds, etc. Are there any uses for them – maybe tomato juice or tomato soup or something? Harvey, you could feasibly push the pulp through a mesh strainer or food mill to strain the gel from the seeds, then use the gel as a base for a sauce or dressing. However, you would need to add other ingredients to it– the gel on its own is very thin. It does have some flavor and nutrients in it. You could also add the gel to existing juice or soup, but you can’t make tomato juice or soup from the seed pulp, since the majority of flavor (and red color) comes from the tomato flesh. Unstrained, the seed pulp is very “seedy”– you would definitely want to remove the seeds from it before using the gel for anything. Of course, if you own a Vitamix, you can throw tomatoes in whole without seeding to make juice or soup– the Vitamix will grind up the seeds and everything!